Yesterday I got two new tattoos. This makes 12 or 13 total depending on how you count. Let's say 13. I like the idea of being on lucky number 13... Generally speaking, I get tattoos to celebrate major milestones or honor someone special to me. 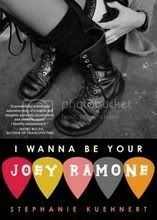 I have my cat's pawprint, a nurse in honor of my NICU nurse mom, a matching tattoo with my sister, another one with my best friend, one I got on a trip to Seattle with two of my closest girl friends who I regularly travel with and one for my favorite band, Nirvana. I have one tattoo celebrating each of my books and a matching tattoo I got with my husband on our first wedding anniversary. 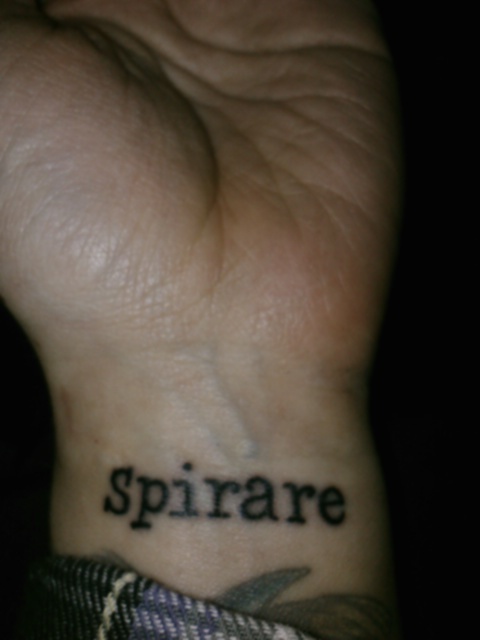 I also have the Latin word for 'breathe,' which is 'spirare' on my left wrist. I got that with my BFF (though hers' is in English) because we're both high-strung, workaholics (and I'm a total worrywart to boot) and we need that reminder. At the time I got the 'spirare' tattoo, I thought it would be cool to get 'scribere,' Latin for 'write' on my right wrist (since that is the hand I write with.) But last January when I got 'spirare,' I was in the middle of my major crisis of faith about my writing career. 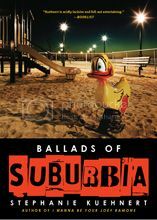 I was doubting if I would ever be published again, if I deserved to call myself a writer anymore, or if I even wanted to be one. 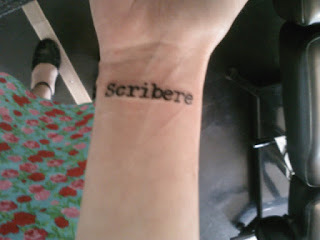 I told myself that when I sold another book, I would get the 'scribere' tattoo along with a Sleater-Kinney quote that has been like my personal motto since I was sixteen years old when I put it in the introduction to the zine, Hospital Gown, that I created to work through the emotionally abusive relationship I'd recently come out of. The quote is "These words are all I am." Writing is my soul, my form of survival--at least I thought it was for most of my life, but again, last year, I was in doubt. 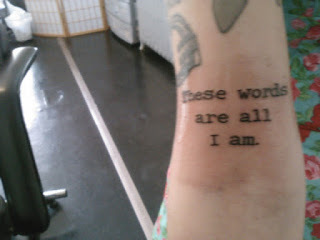 So here's to new ink, revived faith, and a book on submission that I hope believe you will get to read soon!